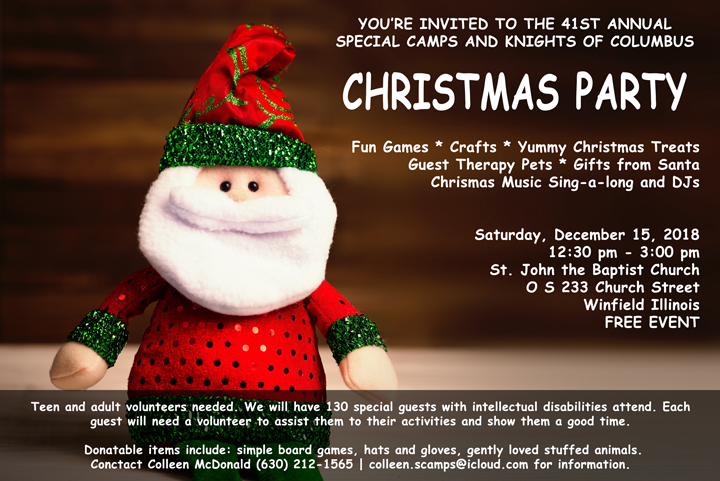 Join the SPECIAL CAMPS family along with Knights of Columbus groups from Wheaton, Winfield, and West Chicago for a special CHRISTMAS PARTY to bring joy to children and young adults with physical and intellectual disabilities. This event in its 41st year since inception will features games, crafts, yummy Christmas treats, Gifts from San for all of the GOOD girls and boys, Therapy petts, Chrismtmas sing-a-longs and DJ, and more. The party will be held in the basement of St. John the Baptist Church and there is no cost. We will likely have close to 130 special guests with intellectual disabilities attend. Plenty of volunteers will be available to assist guests upon arrival. Sorry, no lunch served, Just yummy treats! Please RSVP Colleen By December 1st at (630) 690-0944 or @ colleen.scamps@icloud.com with an approximate # of guests attending!